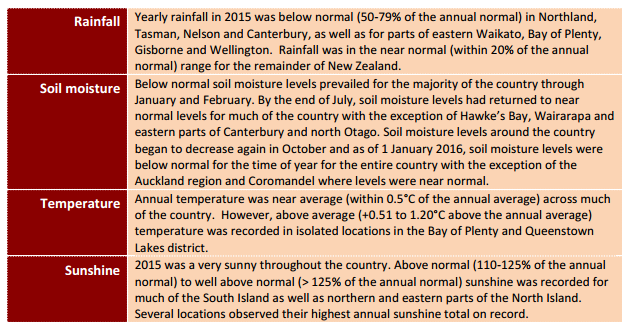 NIWA has just released its climate summary for 2015 and it makes for some fascinating reading. No, it wasn’t a particularly hot year with an average temperature of 12.7°C 12.7 up 0.1°C on the long term average (1981-2010) and the 27th warmest annual temperature recorded since the “seven station series” records began in 1909. By way of comparison, 2015 was Australia’s fifth warmest year on record, illustrating the differing and complex ways in which climate change makes its mark. What is clear from the data however, is the impact of the El Niño weather pattern than made its presence felt in the second half of the year. “2015 was a sunny year for most and drier than normal for some as El Nino began its reign as the dominant climate driver in June. While floods in Dunedin and Whanganui occurred in 2015, there were no sites that recorded near record or record annual rainfall. “However, several locations observed near record or record dryness (lack of rainfall). For example, Kaitaia experienced its driest year on record (records go back to 1948) with Wellington enduring its second driest year on record (records go back to 1958) and Kaikoura having its second driest year on record (records go back to 1898). Complementing the dryness was sunshine – there were thirteen locations that experienced near record or record annual sunshine hours. “2015 was another year of extremes, with El Nino dampening temperature effects of regional warming trends. It was a very sunny year. “From early autumn 2015 the Pacific Ocean again began to warm rapidly, with an El Niño declared in May as atmospheric indicators consolidated, providing a clear feedback onto the ocean.The El Nino event peaked in November at values comparable to the strong El Niño events of 1997–98 and 1982–83. The 2015 El Niño is expected to continue to decline over summer. The result was more south westerlies over the country, with westerlies being particularly strong in October. “These conditions gave especially dry conditions in Northland, and dry conditions in north and eastern areas of both islands. The air flow from cooler sources meant that much above annual rainfall totals were not achieved anywhere. Conversely the more frequent south westerlies and anticyclones in the Tasman Sea gave a year of clear skies and higher than normal sunshine totals – with records achieved in several locations. “Even though the airflow was from ‘cooler’ sources, regional warming trends over the decades meant that temperatures were near average, rather than being below average, which is more typical of El Nino. Extremes were also prevalent – with last summer ending on a very dry note, and El Nino induced drought developing during spring. “Perhaps the most notable extreme events were the Manawatu-Kapiti floods, and Dunedin floods in June 2015. The former were at least a 1 in 70 year event, and the latter more than a 1 in 100 year event. These sorts of floods are what can be expected with a warming world where the atmosphere holds more moisture. “Thus the climate story of 2015 was one of El Nino modifying warming trends, with the normal changeable climate of New Zealand. Every year has its own personality”. “The summary demonstrates just how variable our weather can be, from extreme cold spells to drought and baking heat. Despite that, the seasonal and annual statistics bears the marks of larger-scale climate patterns. The mostly dry and very sunny year goes along with a predominance of the positive ‘Southern Annular Mode’ (SAM) right through the year. 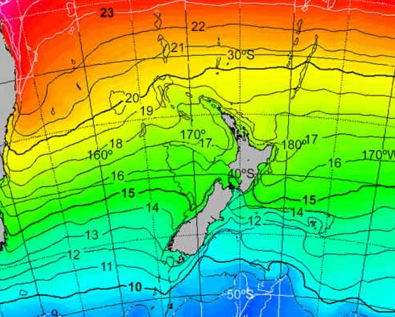 “In the positive SAM, the stormy westerlies retract south over the southern oceans and New Zealand latitudes lie under anticyclones and higher pressures, with more settled and drier conditions across the country. “Positive SAM conditions in the latter part of the year may have been accentuated by this year’s relatively large ozone hole. The effects of El Niño were felt in the second half of the year, with stronger south-westerlies and dry conditions in the east and north overall. “Despite 2015 coming in as the warmest year on record globally, by a large margin (final numbers yet to be released), New Zealand has had a fairly average year temperature-wise. Again, this is typical of El Niño – while it warms most of the globe, it tends to cool New Zealand. The very warm year globally was of course a combination of the climate change/global warming signal and the El Niño.